As mentioned above, news out of OPEC yesterday sent Triangle Petroleum skyward. So, what was the news? Well for about 2 years now, oil has been trading at crisis levels. This is the result of a massive supply glut. In the past, we’ve seen meetings between the world’s larger oil producers, only to find that the meetings end with no deal. Monday through Wednesday, the world’s top oil producers met with an ultimate goal of reducing capping, freezing, or even reducing the production of oil in an attempt to support price growth. While few expected for an agreement to actually be made, the meeting did end in an agreement, helping to lift oil prices and naturally TPLM. Under the terms of the agreement, OPEC member countries will work together to slightly reduce oil production. The organization said that it would be capping production at between 32.5 million and 33 million barrels per day. Considering the current production level of 33.24 million, the reduction is relatively small, but at least we are going to see some production cuts. 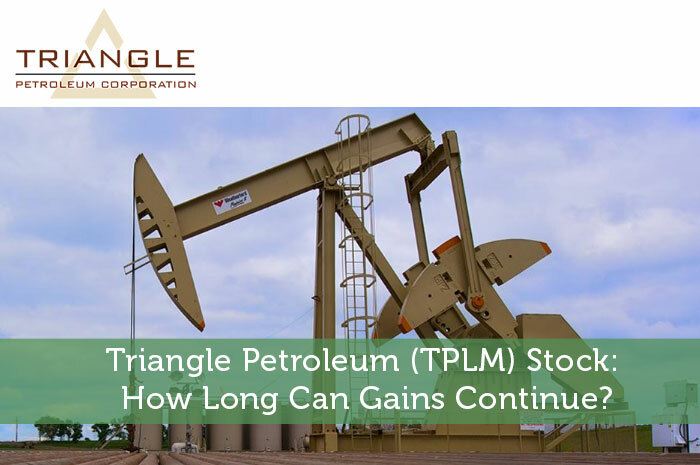 While the production cuts are small, they are lifting the price of oil, leading to gains in stocks like TPLM. As investors, one of the first things that we learn is that the news moves the market. Any time positive news is released with regard to a publicly traded company, we can expect to see gains in the stock associated with the company as a result. Adversely, negative news will lead to declines. In the case of Triangle Petroleum, the stock is climbing as the result of industry-wide positive news. Yesterday, we saw gains of more than 14%, and the strong movement is continuing today. Currently (11:16), TPLM is trading at $0.30 per share after a gain of $0.02 per share or 8.40% thus far today. Moving forward, I have a relatively mixed opinion of what we can expect to see from Triangle Petroleum ahead. In the short run, things are looking great. OPEC has made the decision to reduce production of oil, helping to boost the price of oil and leading to some strong movement for TPLM. This movement is likely to continue for the short run and could even last through the medium-term. However, in the long run, I still have some very big concerns with regard to what we can expect to see from TPLM. As a smaller, independent oil producer, the company is heavily exposed to spot market prices for oil. At the end of the day, the recent announcement that OPEC will be cutting oil production is good. However, we’re seeing very small cuts to production. At the same time, demand is declining in a big way. With demand on the decline, even these small production cuts aren’t likely to do much. At the end of the day, without larger measures, the supply glut is still an issue. Unfortunately, I’m expecting for this issue to weigh heavy on TPLM ahead. Where do you think TPLM is headed moving forward? Join the discussion in the comments below!